The mad cows at the BSE campaign have claimed that leaving the EU will mean big bills for anyone getting ill on holiday because we will no longer have access to the EHIC card. 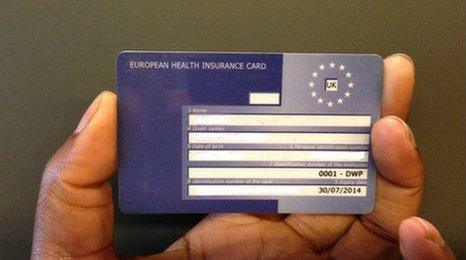 Except Norway, Switzerland, Iceland and Liechtenstein are all members of the EHIC scheme but aren't members of the EU and the NHS has reciprocal agreements with Armenia, Australia, Barbados, Bosnia, British Virgin Islands, Falklands, Gibraltar, Isle of Man, Jersey, Macedonia, Montenegro, Montserrat, New Zealand, St Helena, Serbia and Turks & Caicos which allow British citizens to also get medical treatment in those countries as they would in EHIC countries. Tens of thousands of journeys abroad are made every year by UK residents with the USA being the third most visited destination. Visitors to the USA don't get free healthcare, they buy travel insurance or increasingly get it included with their bank accounts. You can pick up £15,000,000 of health cover for a 7 day trip to the USA for under £23 for an average family of four (we checked) so EHIC is hardly a deal breaker when you're paying thousands for a family holiday.